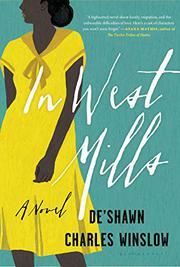 This tender, exuberant, and impressively crafted debut novel spans decades of family upheaval and painful secrets in telling the story of a freethinking black woman in a tightly knit Carolina community. Someone as widely read and as fiercely committed to moonshine and serial relationships as Azalea “Knot” Centre would fit snugly within the sophisticated confines of a major metropolis, even in the early 1940s when this saga begins. But Knot lives and teaches school in the rural hamlet of West Mills, North Carolina, and is viewed by the locals as (at best) something of a crank, a solitary eccentric gruffly determined to live life her way. Knot is in her 20s when, the same month Pearl Harbor is attacked, she discovers she's pregnant by a man who’s left town for the military. As determined as she is to go through this ordeal on her own, especially given her estrangement from her family, Knot is nonetheless besieged by the kindness of her neighbors two doors down, the aptly named Otis Lee Loving and his wife, Penelope (or “Pep,” as he calls her), who agree to find a local couple to adopt the child. That’s the kind of man Otis Lee is, somebody who arranges and fixes things for others, especially those he's closest to. And in Knot, Otis Lee finds a person who needs his help whether she admits it or not. They forge a lifelong platonic bond that can’t be shaken even when Otis Lee has to do the same thing all over again when Knot has another baby by yet another man she’s not marrying. Through Winslow’s evocative writing and expansive storytelling, the layers of Otis Lee’s past life, as troubled and heartbreaking as Knot’s, peel away to reveal how hard it has been for him to remain steadfast and strong to those within and outside his immediate family. And in the brave, hard-bitten, but deeply vulnerable Knot, Winslow has created a character as memorable and colorful as any created by Knot's favorite writer, Charles Dickens. Through more than 40 years of ups and downs, Knot and Otis Lee’s story makes you feel the enduring grace and potential redemption to be found in even the unlikeliest of extended families. Winslow's heroine isn't easy to like. But over time, she reaches into your heart and touches it deeply. So does this book.